Here are all of the important moments Instagram captured this year. 1. 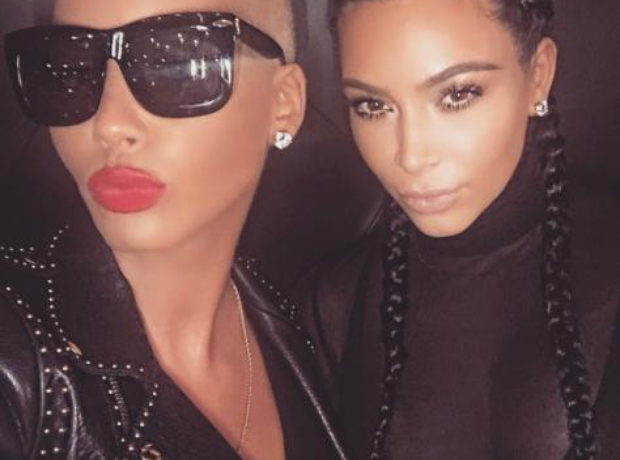 No one expected to see Kim Kardashian and Amber Rose make friends this year. 2. Drake was still recording 'Views' at the start of 2016. 3. After it's April release, it took the world by storm. Drizzy's 'Summer Sixteen Tour' soon commenced. 4. He even stopped by Drake University! 5. To top off an phenomenal year, 'Views' hit a billion streams. 6. Remember when Skepta signed him to BBK and he performed at a Section Boyz show? 7. Skepta also had an incredible year. 13. The Weeknd delivered a stunning performance at the BRITs. 14. Whilst Rihanna and Drake's steamy performance of 'Work' sparked those never ending romance rumours. 15. The on-again-off-again pair have been playing with Aubrih fan's hearts all year. 16. And who could forget THAT swerve at the VMAs? 17. Regardless, Rihanna performed a showstopping medley of her biggest hits at the show. 19. At the same show, Kanye announced his plan to run for President in 2020! 20. The rapper has had a whirlwind year after embarking on his huge Saint Pablo world tour. 21. And continued to evolve his Yeezy brand. 22. There were even rumours of a Drake/Kanye collaboration album! 24. Awards season continued as Beyonce stunned at the 2016 Grammy Awards. 27. Kendrick Lamar collected 5 awards on the night. 28. Whilst Jack U won two accolades. 30. Rihanna's eighth studio album 'ANTI' went platinum! 31. She had an amazing year, selling out venues worldwide during her 'ANTI' world tour. 35. Not to mention she's starring in the upcoming 'Oceans Eight' movie! 38. Other celebrity fashion ventures include Beyonce's popular Ivy Park range. 39. As well as Skepta becoming the face of Uniqlo. 40. Nas dropped by backstage at one of Stormzy's shows. 41. Whilst Kano congratulated Skepta on his Mercury win. 43. And who could forget when Stormzy took over Thorpe Park for the day? 44. Craig David made the ultimate comeback. 49. Big Sean was also busy on the UK festival circuit, including sets at Wireless and V.
50. The rapper also joined Drake on his Summer Sixteen Tour. 54. Kim famously 'broke the internet' with this naked selfie. 55. Later in the year, however, she broke it for a very different reason. 56. Remember when Kim was robbed at gunpoint in Paris? 57. Kim had millions of dollars worth of jewellery stolen from her, including her huge engagement ring. 58. She fell silent on social media, with only her family members speaking out on the event. 59. Nicki Minaj flashed her diamonds, despite Kim's high-profile robbery. 60. Rihanna caused controversy after posting this picture of her and her cousin Majesty. 61. Sadly, Kehlani attempted suicide after she was accused of cheating. 63. Solange dropped her long-awaited album 'A Seat At The Table'. 64. The whole Knowles family came to support her SNL performance! 65. In February, Beyonce released 'Formation' and its iconic music video. 66. She then performed live with Chris Martin and Bruno Mars at the Super Bowl. 68. In April, Bey's incredible visual album 'Lemonade' dropped and stunned the world. 70. Who could forget when she helped surprise one of her backup dancers with this on-stage proposal? 71. Bey and Blue Ivy served up all the mother-daugher goals at the AMA's. 72. She was the ultimate professional when her earrings ripped out mid-performance at a TIDAL concert. 73. Her powerful, high-energy performance of 'Freedom' at the BET Awards will go down in history. 75. Kendrick also joined Ice Cube on stage at Coachella. 76. He later dropped by the White House to visit President Barack Obama. 77. As did DJ Khaled! 79. The couple revealed that they were having a baby girl. 80. And Chyna wasn't shy about showing off her bump. 84. Kim and Kanye's son Saint West turned one this December. 88. Which was recreated perfectly by a group of Halloween party goers! 89. Kim dug out her old Princess Jasmine costume for her Halloween festivities. 91. Her half-sister Kylie nailed her Christina Aguilera outfit. 92. Kylie has been joined at the hip with boyfriend Tyga all year. 93. Beyonce, Jay-Z and Blue Ivy dressed up as living dolls. 94. And new couple Jhene Aiko and Big Sean rocked the Star Wars theme. 97. Alicia Keys rocked 2016 with her empowering 'no makeup' movement. 98. Nicki Minaj and Meek Mill are still going strong. 99. The female rapper was so starstruck when she met Lauryn Hill that she fell to her knees and cried!